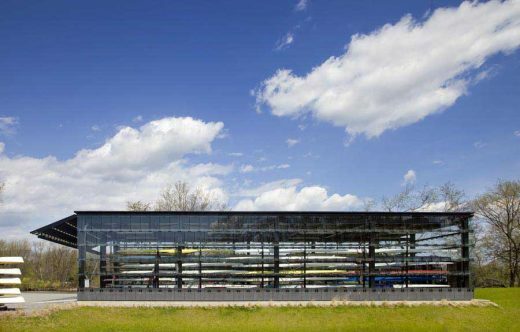 2009 HARLESTON PARKER MEDAL AWARDED TO THE COMMUNITY ROWING BOATHOUSE — DESIGNED BY ANMAHIAN WINTON ARCHITECTS — AT CITY HALL. Last night, 20 May 2010, the Boston Society of Architects (BSA) awarded the 2009 Harleston Parker Medal to the Community Rowing boathouse designed by Anmahian Winton Architects. The event was held at Boston’s City Hall, and was attended by representatives from the BSA, the Boston Redevelopment Authority and Community Rowing, Inc (CRI). The Harleston Parker Medal is awarded each year to “the single most beautiful building or other structure” built in the metropolitan Boston area built in the past 10 years. Anmahian Winton has achieved this with its innovative and sustainable design for the Community Rowing boathouse in its first year of eligibility. Since opening last year, the CRI project has enjoyed an unprecedented level of public interest and acclaim largely due to its innovative design. The building has had an immediate impact on the mission, image, and visibility of CRI. Membership in CRI has doubled since the building opened, and the project has reinvigorated a neglected stretch of public land as an active public park for an underserved urban neighborhood. The Executive Director reports that both the staff and membership feel that they are making a positive contribution to the riverfront and the city of Boston. 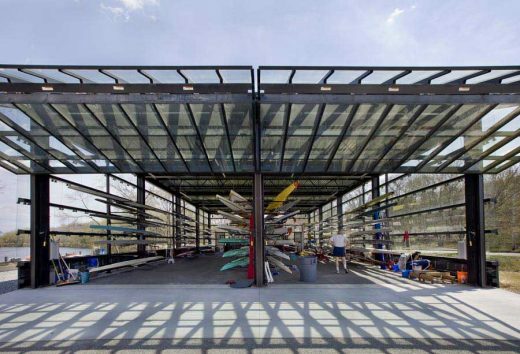 The design of CRI seeks to expand the vocabulary of rowing facilities on the Charles River by exploring abstract commonalities between rowing and architecture, and by engaging relevant regional precedents outside the realm of boathouse antecedents, such as tobacco barns and covered bridges. As a site strategy, a long narrow footprint is divided to engender a public court that establishes both a visual connection to the riverfront, as well as a functional connection to the boathouse: a public invitation to the Charles River and CRI. Enhanced occupant comfort and a significant reduction in energy consumption are achieved by the natural light and ventilation coming into the building through louvers, bi-folding operable vents, and glass shingles. While each type of cladding satisfies functional needs, their experiential effects are more varied: The surface of the building is intended to transform with one’s movement around the building, not unlike the rhythmic punctuations in the fluid medium of the river. Community Rowing, Inc. is the largest rowing organization in the country, representing more than half of the rowers on the Charles River. CRI provides equipment and instruction for rowers of all skill levels, including innovative programs for girls in the Boston Public Schools, and Adaptive Rowing for people with physical disabilities. 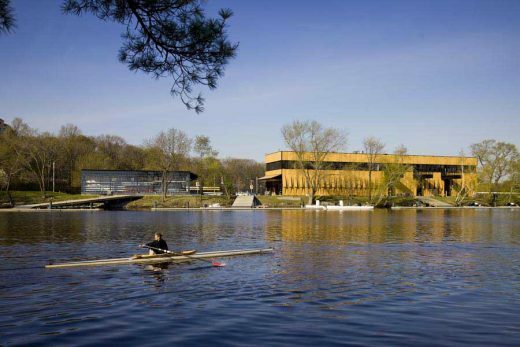 The new CRI building will occupy a site along the Charles River that establishes a bookend to the river’s collection of historic boathouses. The facility is composed of two buildings that form a common public space between them that is both a gateway to the river and a staging terrace for the boats. The smaller of the buildings is a glass pavilion that houses the singles shells. Its transparency allows for a unique perspective on the boats during storage and can be viewed from the adjacent footpaths and roadway. The larger, main building holds 4-person and eight-person shells on the ground floor, and contains administration, coaching, and weight rooms on the second floor. The “core” of the building – stair, elevator, mechanical, boat repair, and locker rooms – is a sidecar building whose separation allows the boat storage and support space to be open and flexible. The skin of the main building is composite panel of phenolic resin and wood veneer that is both extremely durable and natural. The panels operate as louvers, opening and closing to allowing the boat storage space to be ventilated as needed. The louver system is both pragmatic and poetic, lending great functionality to the interior space while also suggesting a building form that recalls traditional New England covered bridges and tobacco barns.